2013 and 2014 mark the 150th anniversary of important Civil War engagements on Johns Island. While they do not compare to major battles like Gettysburg or Antietam, they were significant to those who fought and died in them and they played a noteworthy role in the outcome of the war in the southeastern theater. This begins a series of posts describing these actions. 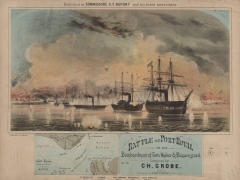 After the bombardment of Fort Sumter in Charleston Harbor in April 1861, the Lowcountry was quiet while the first major battles of the Civil War were fought in Virginia. However, the Union Navy began blockading the port almost immediately and the Confederate government knew the lull would not last long. General Robert E. Lee was assigned as the commander of the 2nd district which included SC and Georgia. 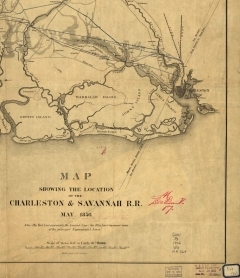 He quickly developed a strategy of defense in depth to secure the vital rail link between Charleston and Savannah. In early November 1861, Federal forces invaded Port Royal Sound and captured Hilton Head Island establishing a major naval and army base. Their ships could now roam offshore interdicting all transport and patrolling up the exposed rivers. The Confederate forces had few naval resources to oppose them. Union troops could also be readily landed on the seaward islands though it was more difficult to bring transports up the shallow, winding tidal rivers. As part of his defensive strategy, General Lee ordered the evacuation of the Sea Islands: Edisto, Seabrook, Kiawah, Wadmalaw and Johns Island. James Island remained strongly garrisoned by Confederate infantry and artillery units as part of the defense of Charleston harbor. The white planters of Johns Island gathered what possessions they could and, along with their families and some household servants, fled to Columbia, Atlanta and family or friends further inland. They hid many of the valuables they could not carry. A reproduction of a Chinese Ming horse buried at Legareville is on exhibit at the Johns Island Schoolhouse Museum. Mrs. Betty Stringfellow of Johns Island has a pair of andirons that were squirreled away up a chimney before the owners fled. Another story describes a precious fiddle that was hidden in the walls of a house and after recovery was a prized family possession well into the twentieth century. A few of the enslaved Africans were brought along to help with the evacuation but most, especially field workers, were left behind. On Johns Island alone this likely numbered well over two thousand people. While some of the rigorous fieldwork went by the wayside it was a very difficult time for those left behind. Some African families were further split apart and those who stayed had to fend for themselves with few resources. Another group that stayed behind were some of the men, young and old, who formed militia units, most notably the Stono Scouts. First formed as the Stono Rangers in November 1861, they were re-designated the Stono Scouts in February 1862. They were commanded by Captain John Basnett Legare Walpole of Johns Island for most of the war and numbered from 12 â€“ 36 soldiers at various times. Most were from Johns, Wadmalaw and Edisto Islands as well as some from inland. The roster at various times included Jenkins, Fripp, Gervais, Roper, Bryan, Grimball, Gibbs, Legare, Trenholm, Burden and Townsend; names still seen and heard around these islands. They generally provided their own weapons and mounts. Their role, in keeping with General Lee’s strategy, was to serve as scouts, messengers and guerrilla fighters. They were to monitor Union activity along the coast and in the event of an invasion, alert Confederate forces inland and delay the Federal forces until reinforcements could be sent. 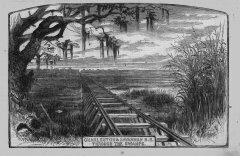 The idea was to keep the larger units at camps inland along the Savannah Charleston Railroad. If Federal troops landed, the scout units were to delay them until the larger forces could be mobilized, before the invaders could move far enough inland to cut the vital transportation link. One of these camps was at Church Flats across from Johns Island somewhat east of the current Stono Ferry golf course. A bridge was also built across the North Edisto River connecting the camp and Johns Island about 2 miles west of the current Limehouse Bridge. How wonderful to pass this info to all of us. thank you for bringing it to life. This is fantastic! Thank you so much for taking the time to write this series. We live on Johns Island and I love the history!